When I was a kid, I didn’t like gingerbread cookies. They were always cute and looked tempting, but the taste was a let down time and time again. The cookies either verged on choking me with spices or had so little spice they tasted bland. Even worse was the texture, since half the time the cookies were so hard that I worried I’d break a tooth trying to bite into them. None of this would have been a problem if I had baked my own gingerbread cookies, I’m sure, and I wouldn’t have had to wait until adulthood (I’ll concede that I may have had a good gingerbread man or two as a teenager) to really enjoy them. 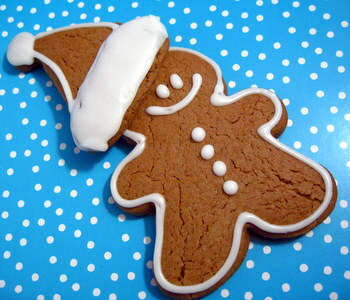 This is one of my favorite gingerbread cookie recipes. The dough comes together quickly and is very easy to work with. It is a rolled cookie dough that needs to be refrigerated before you can take cookie cutters to it, so the waiting is the worst part. The dough can be rolled and rerolled several times without toughening up the resulting cookies and, while the cookies do puff up some during baking, they hold their shape pretty well. On top of all of that, the cookies taste great. I think I hit upon my favorite gingerbread spicing combination here, with a generous amount of ginger accented with cloves, cinnamon and nutmeg. I almost always throw in a pinch of black pepper for some extra bite. The cookies can be baked up to get two different results. If you roll them out to be on the thicker side (just under 1/4 inch thick), they will be soft and chewy, and will stay that way even if they’re stored for several days. If you roll them out a bit thinner (1/8 inch or less) the cookies will be crisp, but not hard. Both crispy and chewy cookies should be frosted after they have cooled. I like a lemon-flavored icing for decorating, as it complements the spiciness of the gingerbread and brightens up the cookie as a whole. You can also top the cookies off with sprinkles or chopped, candied ginger if you prefer not to ice them. In a medium bowl, sift together flour, salt, baking soda, nutmeg, ginger, cloves, cinnamon and black pepper, if using. In a large bowl, cream together butter and sugar until smooth. Beat in molasses, water and vanilla, then gradually add in flour mixture until a smooth dough forms. Divide dough into two or three pieces (dough will be quite soft), cover with plastic wrap and refrigerate for at least 2 hours, until firm. On a lightly floured surface, roll out dough to just under 1/4 inch thickness. Use cookie cutters of your choice (2-3″ gingerbread men are ideal!) to cut dough. Place cookies on a parchment-lined baking sheet. Bake for 9-12 minutes, depending on size of cookie cutter. Cookies should be slightly firm to the touch at the edges. Let cookies cool on baking sheet for 5 minutes before transferring to a wire rack to cool completely. On a lightly floured surface, roll out dough to just under 1/8 inch thickness. Use cookie cutters of your choice (2-3″ gingerbread men are ideal!) to cut dough. Place cookies on a parchment-lined baking sheet. Bake for 9-12 minutes, depending on size of cookie cutter. Cookies should be slightly firm to the touch at the edges and will be lightly browned. Let cookies cool on baking sheet for 5 minutes before transferring to a wire rack to cool completely. When cool, decorate with lemon icing (recipe below). 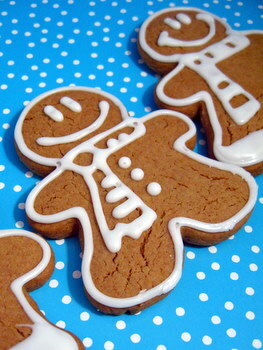 Makes about 30-40 gingerbread men, depending on size of cookie cutters used and whether you make them thick or thin. In a small bowl combine powdered sugar and lemon juice. Substitute milk or cream plus 1 tsp lemon extract, if no fresh lemon juice is available. Add enough lemon juice to make the icing thick and pourable, but not runny (start with 1-2 tbsp and add more if necessary. You can always add a bit of extra sugar to thicken it if you add too much) and stir until very smooth. Scrape into piping bag with a fine tip or a ziploc bag with a corner cut off and pipe onto cooled cookies. Allow to set for at least 30 minutes, until firm, before storing cookies in an airtight container. What a perfect gingerbread cookie & recipe—thanks! Poor you. My brightest and greatest memories that’ve got something to do with ‘piparkook’ as we call our gingerbread, are from the time I was about 5-8 years old. Baking them was always a family event and everybody was sitting around a small kitchen table, kneading the dough…it was wonderful! There were heaps and heaps of cookies! I love the idea of black pepper in my gingerbread. If I can make these this year, I will try this recipe. Yum! These are too cute! I love the huge grins they all have. My sentiments exactly, on gingerbread cookies i had growing up but this recipe looks like such a winner :)Thanks for sharing! Thanks for this recipe and timing! I had planned on making gingerbread cookies last night for our Christmas decorating and decided to try this recipe since my husband is usually NOT a fan of them. The lemon icing sounded interesting as well. My husband actually commented on how he LIKED them and I loved the addition of the lemon flavor. Thanks!! I love reading food blogs! You can find such useful information. I really love Gingerbread cookies and I like them both soft and crisp however I never knew how to get one or the other…so that you for sharing this! Dear Nicole, thanks so much for this awesome recipe. But in my country, all measurement is by grams. Could you guide me how to convert this recipe from cup-measuring system? I planned to make gingerbread cookies to share with family, friends and colleagues this Christmas. Thanks so much, Merry Christmas & Happy New Year ’08. Thank you so much for your amazing recipe! I have never tasted gingerbread cookies as good as this and I doubt I will ever want to after having tried these out!! I brought them to work and they were a huge success. Everyone keeps asking me about the recipe…your instructions were perfect down to the last detail! What a winner recipe. I have the worst time finding good gingerbread cookie recipes and this one is a winner. Even my husband thought it was fabulous which is really saying something for him. I was just wondering… what are cloves? and does it taste a lot different with coffee vs water? I made your recipe last night — and the cookies are delicious! Spicy and chewy (made sure not to roll the dough to thick). Instead of pipetting the frosting, I spread it with a spatula and decorated the men with holiday sprinkles. My family (and boyfriend) love them! Thanks for the tip. I naver manage to make any good gingerbreads. They always has less taste than the ones you buy in boxes at the supermarket. Maybe I should try this recipe. I made these over the weekend using coffee instead of water. They were FABULOUS! My family loves them. I added a little melted butter to my icing and it tasted good. they also set up well and were easy to stack & serve. By far my best experience with gingerbread and much tastier than buying the dough at the supermarket. I love that this recipe is vegan, I don’t have to replace anything except I will make them gluten-free by using brown rice flour. I also love that you gave your men scarves to wear, I will try that next time I make some! This is the recipe I have been waiting for!! Its chewy and not too spicy….a snap to make and the dough is easy to handle. I will be making these throughout the winter…not just at Christmas time! I grew up in France where I always saw gingerbread men cookies on TV and boy was I let down the first time I had one. Your recipe is delicious. I followed it to the letter. It was my first time making these as presents for my coworkers for Christmas. They want more and asked for the recipe. It was so easy and fun to make too. I can’t wait to make more tonight. I might substitute lemon juice for orange juice as I like orange/spice holiday smells. I love your recipe for Ginger Cookies. Howerer, in todays modern society, I believe it might be more politically correct for us to rename this delicious treat Ginger People or Persons. politically correct schmolitically correct! Unbelievable… fancy the ridiculous notion of renaming gingerbread men gingerbread people or persons. If you get offended at that, that’s pretty sad. made these exactly according to the recipe and they are incredible. Iâ€™m not generally a fan of gingerbread cookies unless they are out of the ordinary and these hit the mark. AND, my dh, who loves pb cookies and do-si-dos in particular, had 8 of them in a row. Thanks for the recipe! Any thoughts on how long the dough will last in the fridge or if it would hold up well frozen? My goal is to pre-make as many different doughs as I can for this year’s holiday baking and then spend one day closer to Christmas actually baking things off. Cookies were great! But the icing? 2cups conf sugar to 2 -3 tablespoons didn’t sound right but I figured I am the amateur! And I only have 1 lemon left. Maybe I will add milk? Would be grateful if someone could clarify what I did or read wrong! Merry holidays! Those gingerbread men look delicious! I think these cookie cutters are awesome. You made some good points here.Keep us posting. Excellent article i am sure that i will come back here soon. What template do you use in your site? Brown sugar or white sugar? Anybody find out what Gingerbread man cookie cutter she uses? Sounds easy, but you don’t say how much butter to use. Kelley, unless I’m misreading what you meant, it says 1/2 cup of butter. Made these this evening, turned out excellent. I used brown sugar. can u use shortening instead of butter? or maybe use half & half? This is the best GM recipe so far. It’s spicy, and soft… my friends absolutely raves about them. Thanks. I would imagine that you could substitute solid shortening like Crisco or margarine instead of the butter. Gingerbread is actually a good place to make that substitution taste wise because the molasses and spices will mask the lack of butter flavor. If you want to use half and half, you should probably use that instead of the coffee/water, not instead of the butter. Using it instead of the butter will change the liquid to solid ratio of the dough. That will probably make your dough much softer and more difficult to roll out. I love your recipes, Nicole! They are always really tasty and special. These cookies were soft, puffy, sweet and not too spicy. The lemon icing was delicious. If anyone is reading this, I’d recommend they use this recipe. Happy Holidays! One note: I did add an egg to this. Pre-Bitten Gingerbread Men | That's Cooking!